Thank you to all who attended my July 18 watercolor pencil workshop! Informative watercolor pencil workshop. Derwent pencils and Strathmore smooth Bristol were provided for student use! What is it and how to I get some? The word is freely bandied about in the art world when referencing well-known artists (past and present). But what is it and how does an artist get it… AND do you want it! In brief, an artists personal style is the culmination of how an artist handles the subject and paint on their canvas: i.e. brushwork, proportions, perspective, composition and more. All of these things become unique to each artist and the result demonstrates their style of creating a painting. Your style is there from the beginning, but being a novice, it isn’t completely developed. Similarly, a painting style will develop in a practicing artist. First you learn the basics (composition, drawing, colors, value, shading, etc) Then you learn to apply them to a variety of subject matter. After you have created a larger body of work, you will see that your work is recognizable from another artists painting of the same subject. Style is usually recognized in a professional artist after they have painted a larger body of works. It then becomes evident that they were all created by the same “hand” Which is as unique as a person’s handwriting. When I teach, I enjoy having everyone create a painting from the same still life or whatever. The resulting paintings are unique to each artists hand. Their individual styles shine through even though the subject matter is the same. Each person emphasizes the subject matter differently, handles the paint differently, sees color relationships differently, etc. This is part of what creates individual style. Style can be evident very early on but it usually morphs as an artist becomes more experienced in understanding composition, color theory, paint handling, perception and creation. When a mature or professional artist changes their M.O. from say painting portraits to painting landscapes, their style is still identifiable in the new work. In the beginning, I recommend picking a genre and sticking to it while you develop your skills. For instance just paint leaves or flowers or landscapes or portraits, etc. If you intend to show in galleries, they like to see a fairly large and consistent body of work. If one of your paintings sells, they want to be sure that you can reproduce the magic and not just be a “one hit wonder”. The more you practice your painting, the more evident your style will become. Don’t be surprised if others notice your style before you do! Then google them again with “portraits” or just their name to see all images. Do this with many artists – see how each painters body of works has a recognizable aspect to it. to in your favorite landscape paintings. after you can re-create your desired colors – it helps to paint a page of cloud like structures and use all of the colors that you selected. *Practice with the paint until you have good clean color and understand how the colors interact with one another. Don’t think landscape… yet. *Any good painting begins with a good drawing. Poor composition can ruin a painting with perfect color notes. So understand good composition be it for an abstract or realistic landscape. Take many photos close up and far away. Do not slavishly paint from a photo. and why you took the photo to begin with. was explored for a painting. images are copyright protected to the individual and are not for use other than in this post as a learning tool. 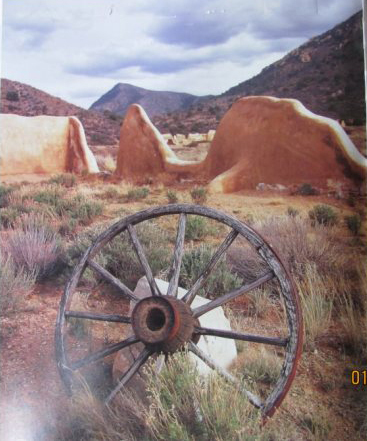 (above) Original Photo of desert area with wheel dominating the scene. Wall blocks viewers eye from easily passing through to the upper portion of the scene. 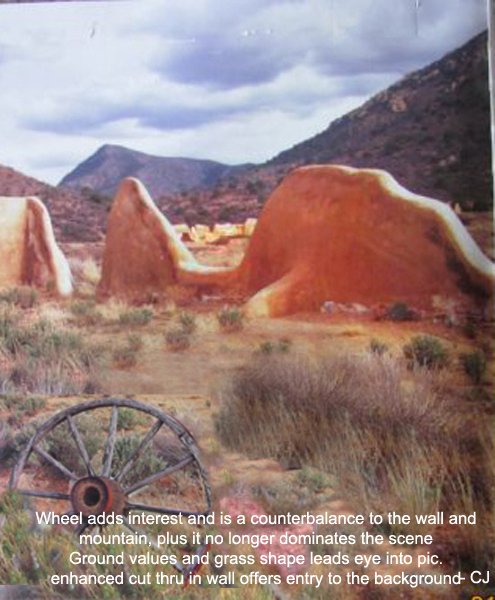 Artist would like to paint this historic scene and does not have the opportunity to re-shoot image – So here are a couple of options in keeping with the integrity of the sceen. Create value in your paintings!! Do you find it difficult to differentiate color change from value when creating a portrait or other artwork? One way to create a vivid map of value is by using the “posterize” feature your photoshop type program. To begin, change your image from color to black and white in your photo program. [in Photoshop cs2: image>mode>grayscale]. Simply referring back to the black and white image can also be a great help if you do not have the ability to posterize! Use the posterize tool to accentuate the values. To posterize in Photoshop cs2, click on “Image” then “Adjustments” and then “Posterize”. Make sure the “preview” box is ticked so the changes show on your image as you change the number in the box. When you paint from these, begin with the image reflecting the lowest posterize number (like 1 or 2) then very accurately add details from each subsequent image with a larger posterize number. You will notice that the higher the posterize number, the more the image will look like the original black and white photo. So to get accurate results, posterize three or 4 copies of your image perhaps set at levels 2, 4, 5, 6 – Try it out and see what best suits your visual needs. At first, you may need may variations, later you may only need 2 or 3 or less…or more… – it is an individual thing- no right or wrong answers here. Carefully and accurately paint large areas of similar value and then move forward to the more detailed printouts in subsequent painting sessions. A gentle hand and an eye for detail is needed when painting the value masses so take your time – the underpainting is a very important phase and will greatly affect the finished painting. The underpainting must be completely accurate. To keep from creating an underpainting that is too harsh, perhaps use variations of raw sienna or similar instead of black – try not to paint harsh lines where the value will later transition from one to the other – study the transitions – if needed, print more variations and transitions using the posterize tool. You can finalize this piece via glazes of color (matching existing values in underpainting) or just keep it as a study. The idea behind this is to see the value changes in your photo stripped of color and detail. This will result in more accurate paintings – no matter the subject. If you play around and posterize a color image, you will find that you have probably seen this style of painting before! Try it! If you choose not to paint a Grisaille, the posterize tool is still very helpful in seeing value changes in your photos! I teach monthly Encaustic workshops, and great weekly open media art class at Arizona Art Supply. CJ Rider is recognized for her Custom portraits, Western scenes and more. 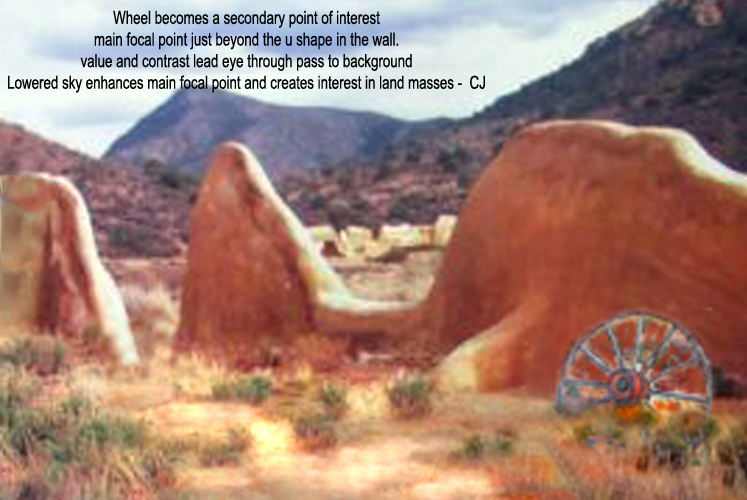 A strong Multimedia artist, CJ Rider teaches a variety of arts programs at Arizona Art Supply. Among her offerings are Encaustic, Watercolor, Oil, Pastel, Pencil, Acrylic and mixed. Coupled with creating her own artworks CJ’s desire is to give something back to the community and to help artists develop their skills. As an artist’s advocate she has introduced new artist opportunities in the form of permanent artist display areas, public shows and events. Check out a few pics from my latest Encaustic Demo= we had fun! Everyone participated in experimenting with the wax. check my website for a series of Encaustic Workshops and more! Many paintings fail due to poor value balance. If a painting is nearly all one value, it will lack life even if it is correct compositionally. with experimentation of the numbers in step #3 and 4 you can see that the higher the setting the more detail shows up. the idea is to not have the detail and only see larger shapes of value (light and dark). You can do this as a pre-painting step – run your image through this process and then reference this print-out to make sure you preserve proper values as you paint. You can also take a photo of a completed painting and run it through this process to see if you have the needed value changes within the piece.